Everyone who wishes to operate forklifts must first complete OSHA-compliant training and receive their forklift license. This piece of paper serves as a proof of training and signifies the level of training you completed to operate forklifts in a professional setting. However, if you have a lost forklift license, you may be worried and wondering what you should do. Can you still operate forklifts? How can you get your forklift license replacement? CertifyMe.net has complete training courses for complete OSHA compliance. What’s more, we’ll help with lost forklift licenses – keep reading to find out how! I Lost My Forklift Certification Card Can I Still Drive Forklifts? As soon as you have lost your forklift license, you should tell your employer. They will be able to confirm whether or not you did in fact complete initial forklift training and received your license. There are no specific OSHA requirements for a lost forklift license, but since it is required to operate forklifts, it is best advised to temporarily stop operating forklifts until your forklift license replacement comes in the mail. If an accident were to occur involving the operator missing the forklift license, there could be cause for further investigation and more serious consequences. If you received forklift training from CertifyMe.net, have your employer contact us about your missing forklift license. We will be able to tell you what to do to get another license. One of the reasons why so many companies choose CertifyMe.net for their forklift license needs is because we always have backup records. If you lose your forklift license card, we can send one right away! As we suggested above, have your employer contact CertifyMe.net, or whichever training program you trained with, to ask about sending a forklift license replacement for the lost forklift license. We should be able to find your account information to confirm you received initial forklift training. If you are applying for a new forklift job, simply tell your employer, I lost my forklift certification card, and request that they retrain you. It is an employer’s responsibility to provide training for their operators, so the worst case scenario would be that you have to be retrained and reassessed. 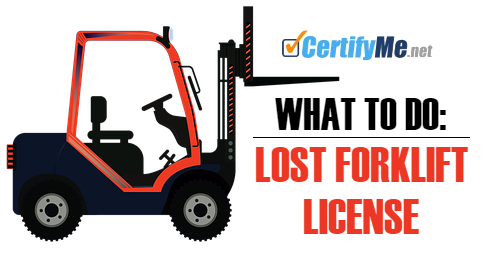 A lost forklift license isn’t the end of the world – simply contact CertifyMe.net, and we’ll send more. And remember, whenever your forklift license is set to expire, we offer refresher training, too! If you need to complete initial forklift training to receive your forklift license, or it’s been three-years or more and you need to renew your forklift license, you’ll find exactly what you need at CertifyMe.net. For employers, CertifyMe.net has you covered when any employee says, “I lost my forklift certification card.” Since we provide HR paperwork and complete documentation, your employees are able to keep working while their replacement cards are in the mail! Don’t let a lost forklift license get in the way of a productive workplace – contact CertifyMe.net today. CertifyMe.net offers forklift training for new and aspiring operators, in addition to training renewals that are always free if you complete initial training with us. We provide training for Warehouse Forklifts, Pallet Jacks and Order Pickers, and Rough Terrain Forklifts. Each of our forklift classes are online and can be accessed from any device with an internet connection, 24/7. That means that operators nor employers have to spend any time or money on travel time or costs driving to an offsite training facility. In fact, in only about one hour, operators can complete their forklift training and print their operator certification card. If you have any questions about our forklift training, or how to replace a lost forklift license, get in contact with the forklift training experts at CertifyMe.net today. We look forward to working with you for your complete OSHA training needs – thanks for visiting CertifyMe.net!